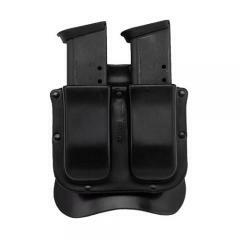 The counterpart to the Matrix holster line, the M11X holds two magazines on the belt. Attaches with a paddle that fits belts up to 1 3/4". Excellent fit and construction (I liked the drain holes). My only quibble is that it protrudes away from the body far more than my beloved Fobus model for the same mags. That said, I shall use the Galco at the range and the Fobus for concealed carry.